Suzuki Pakistan has introduced a Mobile Van Service for its vehicles customers in Pakistan. The company had introduced this service earlier this year but now the company is advertising this service for its customers. Currently this service is available for Karachi, Rawalpindi and Islamabad customers. 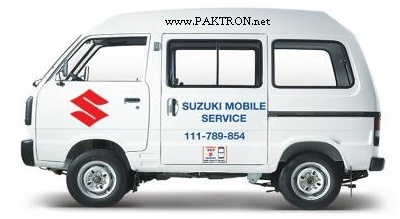 Suzuki Mobile Service: In case of any trouble with your vehicle, just dial Suzuki Mobile Van service at 111- SUZUKI (789-854) and our qualified technicians will be there to help you out. If your Suzuki Car faces any trouble on the roads and highways of Pakistan i.e. 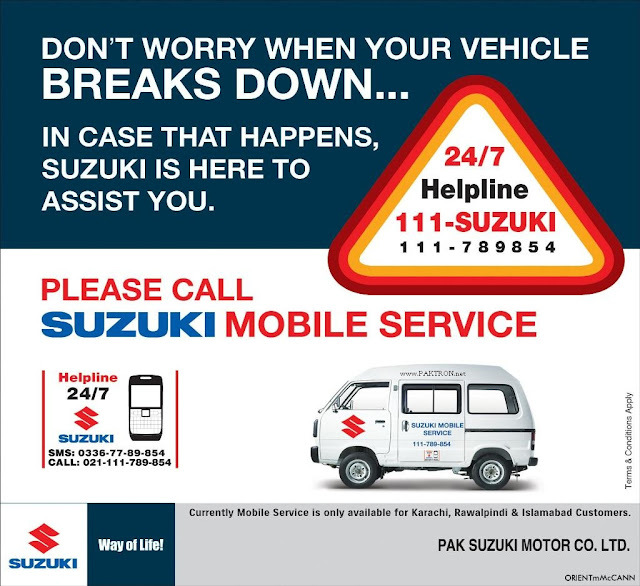 on GT Road, Motorway or on any other road on in case of Emergency then you can call Suzuki Mobile Van to avail this service. Terms and Conditions apply. Don't worry when your vehicle breaks down.. Suzuki is here to assist you.